This article describes the importance of time in the proper cleaning of canisters used to perform US EPA Method TO15. Too much emphasis has been placed on total number of filling and evacuation cycles, when in fact the number of cycles has very little to do with how effectively canisters are cleaned for reuse. To better understand the proper cleaning of TO15 sampling canisters, we have to look at what is really going one inside the canister when samples are collected. Canisters allow whole air to be collected for laboratory analysis under controlled conditions, and in many cases, this could be weeks later. This approach follows the Scientific Method better than adsorbent based sampling, as the actual process of extraction of volatile chemicals out of the air sample is performed on a fully tested preconcentration system rather than on tubes that have not been individually tested for analyte recovery. This greatly reduces the number of uncontrolled variables, which is the hallmark of a good scientific experiment. The tremendous number of other advantages canisters offer have been well documented over the years. When a sample is introduced into a clean canister, the internal surface is expected to be inert such that all chemicals remain in the gas phase. In reality, even the most inert canisters will have some surface interactions that can cause a fraction of the sample to adsorb onto, or into the wall of the canister. If these very week adsorption forces create any catalytic effect, some highly reactive compounds might undergo a chemical reaction, reducing the overall concentration of these compounds in the canister. For most TO15 compounds, reactions are not a problem in most canisters unless foreign particles have been introduced, but a partial partitioning of the sample into the surface still means that some fraction will not be introduced into the analyzer later in the laboratory. For canisters shown to be inert, this fraction may be just 1-10%, meaning that 90-99% of that chemical will be available for analysis, more than meeting the accuracy requirements of method TO15. This partitioning into the canister surface then creates the analogy of the partitioning of the sample off of a solid sample during headspace analysis. The greater the target compounds partition into the headspace, the closer recoveries get to 100%, and therefore the greater the accuracy. Eliminating Surface Contaminants takes TIME! So what about the remaining 1-10% on the walls of the canister? This is the fraction that creates the challenge for canister cleaning operations. It must be remembered that this 1-10% that went into the surface did so over several days or even weeks. The rate of penetration into the surface is probably fairly constant, but as the amount “in” the surface increases, the total rate of target compounds coming out of the surface also increases until an equilibrium is reached where the rates are equal. Due to the inability to remove all pores from stainless steel canister surfaces, coated or not, some of these compounds can work their way well into the surface, and will require TIME for them to diffuse back out. Remember that if it took several days or even a week for the equilibrium between the gas and surface phase concentration to reach equilibrium, it is not reasonable to think that a quick 2-3 cycles will achieve a completely clean canister. In fact, what is really happening is that with the very first evacuation, the equilibrium between the gas and surface phase has been disrupted through the rapid reduction of the concentration of gas phase compounds. Almost immediately, the rate of penetration into the canister surface drops to near zero, and the rate of transfer from the surface back into the gas phase continues to try to re-establish this equilibrium. The longer this process occurs, the cleaner the canister. Why do Some Canisters Clean Very Quickly? Let’s do the math. For Ambient air samples, typical concentrations are from 0.05 – 5 PPBv. Therefore, even when considering as much as a 10% loss into the surface of the canister for some compounds, a single evacuation will drop the total contamination in the canister by 10 fold, down to 0.005 – 0.5 PPBv. This single evacuation brings most compounds below the reporting limit for most laboratories. Obviously, the more inert the canister, the less there will be in the surface of the canister at the start of cleaning, and the less time it will take to get below reporting limits. Also, the more inert the canister, the less the surface will try to hold onto that remaining 10%, so the faster it re-equilibrate into the gas phase where it can be removed. We can start to create a picture, then, that explains why the number of cycles of cleaning is not as important as the amount of time given for the surface contaminants to diffuse back into the gas phase where even a single cleaning cycle could remove them. The rate of transfer back out of the surface may be elevated by increasing the temperature during cleaning, but for coated canisters it is not recommended (or needed) to go above 80-100 deg C during the cleaning process, and temperatures above 60C should be avoided when using coated canisters and zero air as the cleanup gas, due to potential oxidation of the proprietary ceramic surfaces. "The longer this process occurs, the cleaner the canister." How much TIME does it Take to Clean Canisters? The time needed to clean canisters mostly depends then on a combination of canister inertness and the initial concentrations in the canister. If 10% is lost into the surface, leaving 90% recovered during analysis, it was earlier agreed that this is an acceptable recovery leading to good method accuracy. However, if the initial concentration is 100 PPBv, then 10% represents 10 PPBv. That is, a very quick evacuation followed by isolating that canister for a few days could result in around 9 PPBv in the gas phase, and 1 PPBv in the walls of the canister, again achieving that equilibrium ratio of 10% in the surface (in this example). In reality, the equilibrium is effected the “moment” the canister starts to evacuate, so some of what is in the walls of the canister will come out upon that first evacuation. Given that the walls were exposed over several days or weeks, it is not a good assumption that this equilibrium will re-establish itself too quickly, and especially the fraction that has worked its way furthest into the wall of the canister will take the longest time to diffuse out. In this 100 PPBv example, as much as 1% might be left even an hour after the start of the cleaning, and even with temperatures at 80 deg C, and that 1% equates to nearly 1 PPBv left in the canister should cleaning stop at that point. This is not meeting the normal requirements of Method TO15, which is 0.2 PPBv, so some additional cleaning would be needed. Exactly how long would again be determined by the ultimate inertness of the canister. In general, the higher the concentrations in the canister, the longer it will take to clean them, especially for heavier C10-C12 compounds where as much as a 10% loss in the walls may be fairly common. 3. Concentration of Contaminants in each Canister. We have already described the advantage of using canisters which are more inert. The greater the inertness, the lower the percentage loss into the walls of the canister, so the shorter the length of time needed to achieve residual contamination that is below required reporting limits for all target compounds. However, the number of canisters cleaned simultaneously and how to handle those canisters that are at higher concentrations will be handled individually. Cleaning a larger number of canisters at a time will automatically increase the TIME parameter. Each cycle will take longer, and it will take longer to reach the final 50mtorr high vacuum. This in turn provides a longer period of time for outgassing from the walls to occur, ultimately yielding cleaner canisters. If you clean 12 6L canisters for 4 hours, they will be cleaner than 6 6L canisters cleaned for 3 hours, and you’ll have an overall increase in productivity of 12/6 x ¾ x 100% = 150%. 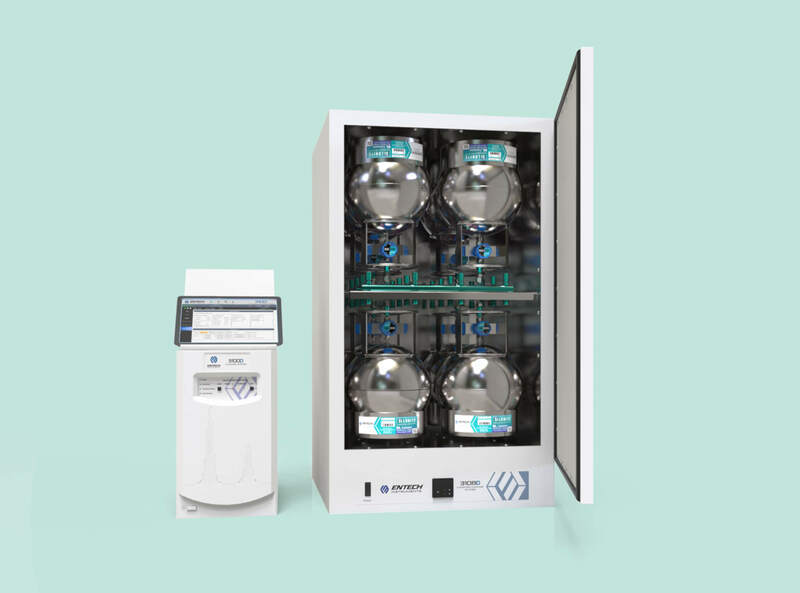 When cleaning canisters with Micro QT valves, cycle cleaning can take longer due to the smaller opening in the Micro QT valves, but labs are reporting that their canisters are even cleaner. Cleaner canisters means fewer that will fail the blank certification test, and this needs to be considered when establishing the length of time in which to clean canisters. If you add 20% to the length of the cleaning time, but almost no canisters fail the blank test, then efficiency may actually be improved overall. "This in turn provides a longer period of time for outgassing from the walls to occur, ultimately yielding cleaner canisters." Sometimes when dealing with highly contaminated canisters, it is better to simply achieve a vacuum on these canisters and then allow them to sit for a day to re-establish an equilibrium at a lower total concentration level prior to placing them onto the cleaning system. Otherwise, you may be looking at spending a day on your cleaner, rather than using that day to clean up several batches of less contaminated canisters. Canister containing compounds with concentrations 200-500 times higher than reporting limits should be considered for this separate evacuation and equilibration process. A dual stage pump separate from the one on the cleaning system can achieve a vacuum 100x lower than atmospheric pressure, and then after a day that canister can be simply opened to room air, and then placed on the cleaning system. Alternatively, after filling with room air, the canister can be pumped down one more time and allowed to sit for yet another day. This might delay the reuse of this canister, but it will ultimately reduce the number of failed blank tests by giving high concentration canisters a chance to return down to more ambient levels after a couple of days. This simple evacuation procedure can also be used to verify that there is no condense water in the canister, if the canister is held up-side-down during evacuation and a plastic hose is used to visualize any water droplets. Keeping water out of the cleaning system is important to reduce the load on the high vacuum pumping system, thereby extending the useful life of the pumps. So there you have it. If you are finding that your canisters are not clean enough, just increase the cleaning time. Be careful not to fall into the trap of cleaning a small number of canisters in a batch. If you normally clean 8 canisters at a time, don’t run two canisters through by themselves just to get those two canisters out quickly, as they will go through a 3-4 cycle cleaning faster than 8 canisters, and they will not be as clean, guaranteed!! In general, cleaning more canisters at a time, not less, is the key to achieving both clean canisters and good laboratory productivity. Consider adding a second oven to increase capacity from 8 to 16 canisters, or even from 12 to 24 canisters using 12 position ovens. Also consider using the new manifolds from Entech for 1.4L and smaller canisters that boost the number of canisters cleaned in a single oven to as much as 40 for the ultimate in both productivity and good canister hygiene. If you are still using non-coated canisters, consider cleaning the first cycle at ambient temperature before turning on the oven, as non-coated as well as older SUMMA NiCrOx coated canisters need water vapor “on the canister surface” to keep aromatics and polar compounds in the gas phase where they can be removed by the cleaning system. Heating to 80 deg C can literally pull those compounds onto the surface of non-coated canisters, vastly reducing the cleaning efficiency. Entech has only been selling ceramic coated 6L canisters for the past 20 years, so no problem with turning the oven on at the start of cleaning when using Entech canisters. As always, we want to hear from you. If you have any great suggestions, let us know and we’ll include it in a future news letter.